How to Convert Spotify Songs to MP3 Format? 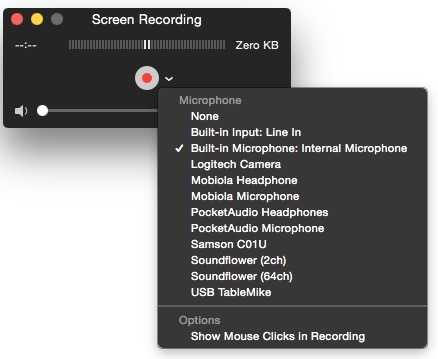 Many people may want to record screen activities on Mac. In this guide, you will get 2 effective solutions to help you record your computer screen activities on your Mac, no matter you’re going to make a game breakthrough tutorial or record online videos. These 2 solutions respectively adopt QuickTime and screen recorder software. Check below for details. Once the recorder is activated, you could click the little downward pointing arrow to reveal a menu that includes Microphone options, Quality options, whether to show mouse clicks or not in the recording, and also where to save the file. Upon recording started, QuickTime player would become invisible. Leawo Video Converter Pro for Mac is intergrated a screen recorder for Mac, which helps Mac users easily record screen actions on MacBook or iMac, screen activities or streaming videos. It allows users to set the recording area and audio source, and then save the recorded videos into MOV format by default. You could use the recorded videos in multiple Apple’s products. Also, it could help you convert recorded videos to other formats like MP4, AVI, FLV, etc. for other uses. Click the below download link to free download and install this screen recording software. And then follow the below guide to know how to record screen on Mac. Launch Leawo Video Converter Pro on your Mac computer. You could then see the “Screen Recorder” icon on the sub-menu bar, by clicking which you could enter the screen recorder section. Some recording settings should be done on the “Screen Recorder” window, including: Video Name, output directory (Save to), audio source (Record Audio From), video quality, video resolution, etc. You could customize the recording area by setting “Record Region > Custom” option or select the “Full Screen” option for full screen recording. Check “Add the video to converter after recording” option if you want to convert the recorded online videos (in MOV format) to other formats like MP4, AVI, FLV, etc. After setting the recording settings, click the red “Record” button to start recording. The program would become minimized into the Dock panel, and then start recording after a countdown. You could then start screen activity for recording. To stop recording, just call the program out from the Dock panel and click the red button again, or, click the little “Screen Recorder” icon on the menu bar and select “Stop”, “Pause” or “Quite Screen Recorder”. The recorded online videos are stored in “Save To” directory. Convert Recorded Screen Videos – Only if you have checked “Add the video to converter after recording” option, the recorded videos would be added to Leawo Video Converter Pro for converting. On the left processing list panel of Leawo Video Converter Pro interface, check the recorded video, hit the clickable icon to invoke the profile setting interface, then select desirable profiles as output format. You could even click “+” button to adjust the video and audio parameters of output files, including video codec, bit rate, aspect ratio, frame rate, audio codec, video size, etc. Set the output directory by clicking “LeawoVideoConverterPro > Preferences > Convert > Output” option on the program menu bar for converting. Click the bottom right convert button to enable the program to convert recorded videos to other formats. Both 2 solutions above are quite effective and they help record screen activities well. QuickTime player offers easier solution, but Leawo Screen Recorder helps convert recorded videos to other formats for more uses.